Welcome to Wednesday Wisdom! 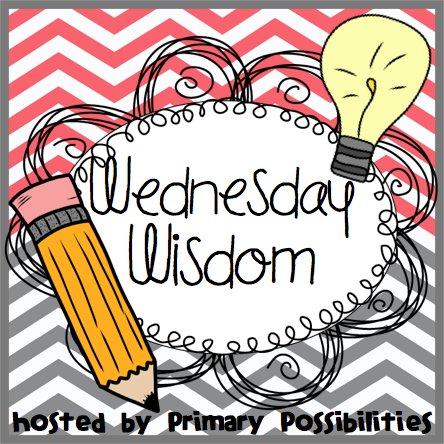 This week's topic is classroom libraries. 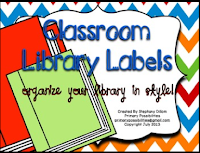 Who has struggled with keeping a tidy classroom library? I seriously wish I had a dollar for every time I said "We are not going to recess until this library is cleaned up!" I would be sitting on a beach right now if I did! I have put off organizing my classroom library for a couple of years now...this is actually a "good" picture of what it looks like. On a bad day, books had been scattered on the floor by some mystery person no one happened to see! My kids have books boxes so they shouldn't even be in the library that much! We use Accelerated Reader in our classrooms, so when I was deciding to organize my classroom that's the first step I took. Sorting my books by reading level was pretty easy but figuring out how to get them to look good took a little thought. I settled on these baskets and learned pretty quick that baskets took up a whole lot more room. So if you are planning on adding baskets you need to make sure you have another shelf or some extra room somewhere to make up for the added space. I ended up having to move my chapter books to another shelf which actually will work out well for me in first grade. They are separated from the other books and most of my firsties won't get to those by the end of the year (I have some high chapter books in there!). I also had to take into account that little kids can't lift as much. 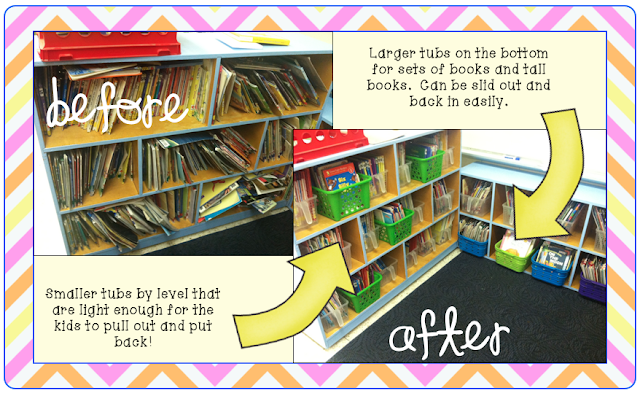 I really would like to have used the big bins at the bottom right of the picture but I knew my kiddos would struggle pulling those out and looking through them especially if they were on the upper shelves. They work fine close to the floor where the kids can slide them out and then back in. They also work great for taller books. All of the taller books that won't stand up straight are laying flat and fit perfectly in those tubs. I also pulled out collections of books. I have quite a few Biscuit, Berenstain Bears, Franklin, Froggy and Clifford books. Kids love these collections so I placed them in larger bins together. Finally, I have a collection of non-fiction books sorted by topic. These are labeled and I hide them behind a curtain. I don't let kids into this section of books because I want to make sure they are accounted (they are my non-fiction resource books for units). However, when I am teaching a unit on frogs for example I pull all of these books out and put them in a basket where the kids can pull them, read them and then take an AR test on them. It is easier to keep track on them when only one topic is pulled at a time. These are the books that I would sorely miss if they came up missing!! I made the labels for these in the "pre-tpt" days. I seriously took post-its, glued a printed off topic on printer paper, and then laminated them. I am sure I thought these looked awesome back two years ago. The labels for these bins are by topic. 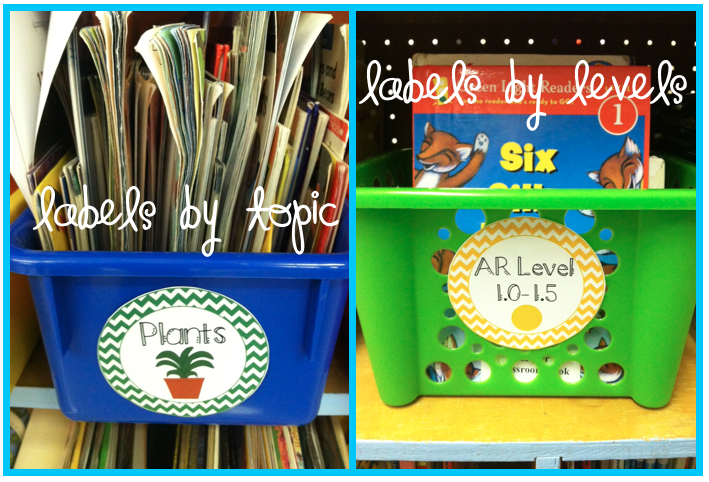 I also made color coded AR labels for the classroom library. I printed them on card stock and laminated them for durability. All of the library books have correlating colored dots on the spine so kids know what basket they go in. You can get these labels (I also included letter labels for other leveling techniques) in my TpT for free so go grab them up and get organizing! There is still way more work I would like to do to get my library super supremo organized but I am almost there! So how do you have your library organized? Link up with you ideas, tips, and tricks! Loved this post. I'll link up when I get some pictures snapped of the area. Thanks so much for sharing your tips and freebie!! Love it!! The labels are too cute. Indiana Goes Back to School! 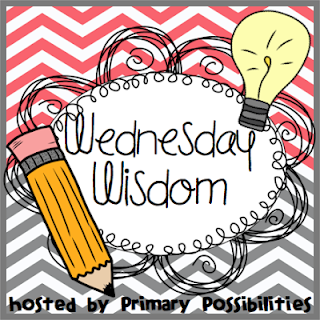 Classroom Themes Part 2 with a Chance to Win!! Instagram Goodies... Come Link Up!